The piano; it’s been on our minds since its inception three hundred years ago. It’s currently the most popular instrument to play in the world. Featured in nearly every major orchestration, it goes without saying that the piano is here to stay. Why is the piano so loved? It could be due the fact that it’s a combination instrument. This means that it falls under two categories of musical instruments. The piano produces sound through strings, classifying it as a string instrument. It also produces sound by applying force to those strings, like drumsticks on a drum. This also qualifies the piano as a percussive instrument. It is between this marriage of percussion and string that a piano is born. How does a piano work? There are many who take the action of playing a key for granted. Many simply assume that the keys immediately unleash the sound. They aren’t wrong, but it’s a much more in-depth process. Whenever you play a key, you are creating a mechanical reaction. Each played key is connected to a wooden lever. The act of pressing the lever allows a mallet to hit a taut string. This connection is what creates sound. Removing the sound is as simple as releasing the key. As soon as a player releases the key, the connection of mallet to string is removed. The note is also snuffed out by a damper connected to the lever. This connection is the heart of the piano. The pianos that utilize strings and hammers are classified as acoustic pianos. The two main categories of acoustic pianos are grand pianos and upright pianos. The main difference between these two are how the strings are oriented. A grand piano will have strings that lay horizontally. In contrast, an upright piano holds the strings vertically. The grand piano is slightly larger and tends to be pricier in comparison to the upright piano. The upright is considered a more casual, user-friendly piano. Let it be known that neither is better than the other. Both will have the standard 88 keys. These keys will include the 52 white keys and the 36 black keys. Some manufactures will extend the number, but the standard remains 88. In contrast to the acoustic piano, there is another form that doesn’t rely on strings to create sound. This, of course, is the electric keyboard. This keyboard replicates the sound and application of an acoustic piano. Instead of activating a string, pressing a key will cue a digital sound. Some keyboards, such as the Yamaha YPG-535 , are made to replicate the sounds of a grand piano. This is the allure of a digital keyboard. It can produce all the sound of a grand piano while being small and lightweight. It doesn’t stop there. 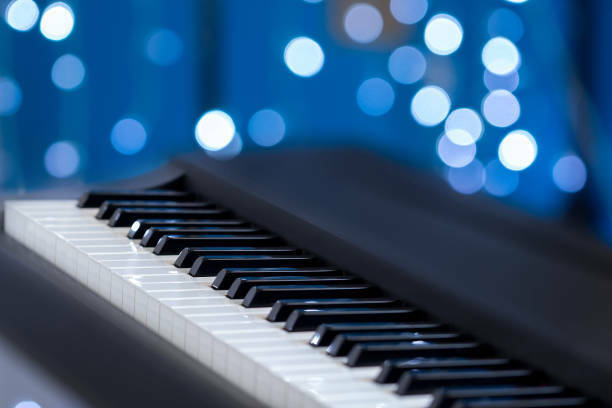 While an acoustic piano is limited in its sound, a digital piano can create all forms of sound. A player can play a jazz standard, a classical concerto, or a synthetic pop song. The sky is truly the limit with an electronic keyboard.